Experience a 3-hour delicious Spanish cuisine tour and enjoy a selection of 10 delicious tastings adored by the locals. Stroll through hip areas, discover the lifestyle and create unforgettable food memories. Get insights from a food-loving guide, and soak up the city's atmosphere on this private food tasting tour limited to 8 people per group. Treat your taste buds with 10 amazing local tastings and enjoy eating like a local. Discover the city’s history through its authentic bites and explore its hip areas. Start your private food journey at Mercado San Anton, a local market located in the lively neighborhood of Chueca. The market is popular among locals and it’s full of stalls selling top quality products. After strolling through the local market, it's time to kick-start your appetite. Try the first tastings: a “sobrasada con picos” a raw cured sausage plus an authentic “croqueta”. Move on to the Salmorejo, a traditional tomato dish from the South of Spain, and enjoy the view over the market. In this hip area, a lot of cool places are popping up next to authentic local bars, creating a unique vibe. Along the way, enter a few places, hand-picked by your private guide just for you. Stand just like the locals do while enjoying some tapas, a traditional cheese from La Mancha region and the delicious Spanish empanada. 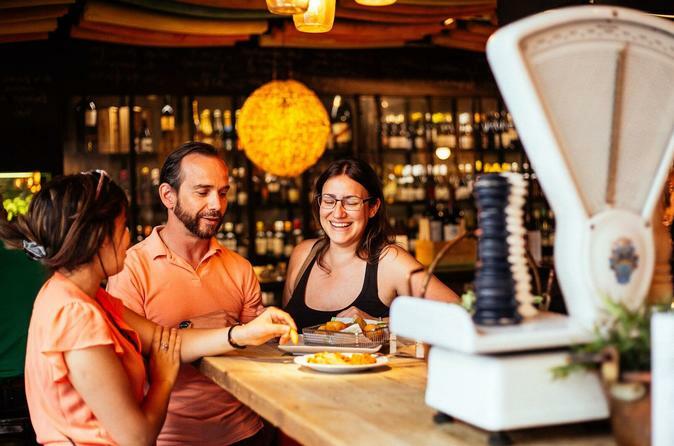 Your local guide will tell you everything about the culinary aspects of Madrid and the history behind the local family-run bars. Make room for something sweet. Have a “rosquilla” at Horno San Onofre, an old pastry which has its own old traditional recipes. “Rosquilla” is a Spanish pastry that became an icon of the sweet gastronomy of the city. Let’s not forget about the yummy Spanish tortilla, an omelette made with eggs and potatoes. Cap off your experience at a cool hip bar where the passion for bikes is mixed with the passion for good drinks. Impress your taste buds with a tasting of Artesano Vermut while enjoying the cozy atmosphere. It’s time to say goodbye to your local guide but not before you ask recommendations for your next days. Our knowledgeable hosts are waiting to give you and your friends an awesome private food experience in Madrid. If you have any diet restrictions or you want to personalize your tour, let us know. It’s 100% possible. Pick one of our private hosts for a real Madrid food journey and enjoy the delicious local cuisine.